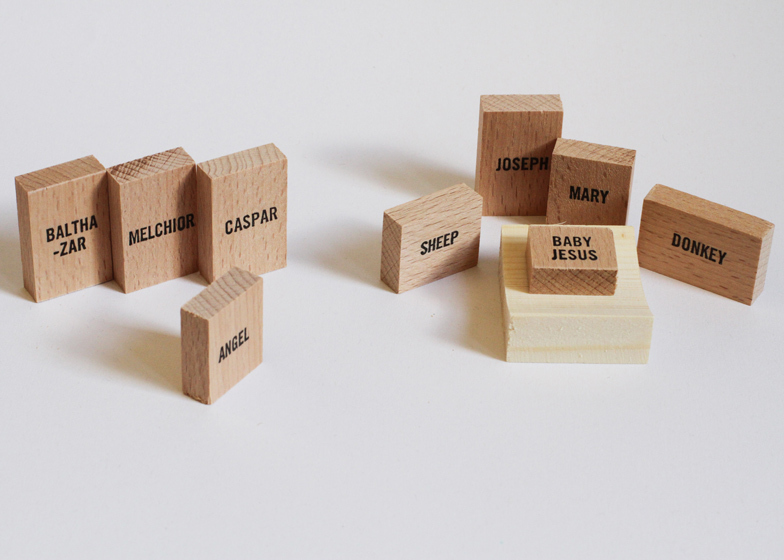 London designer Emilie Voirin has created a minimal nativity set where characters in the Christmas story are represented by wooden blocks with their names printed in plain black capital letters. "The characters have lost their features and colours for a modern appearance that could appeal to both believers and atheists," said Voirin. The contemporary nativity set is handcrafted in beech. It includes blocks with different proportions to represent Mary, Joseph, three wise men, an angel, a sheep and a donkey, plus baby Jesus,placed on a slightly lighter block representing a manger. "The holy scene that has been broadly reproduced is here recognisable by the names only, giving free rein to people’s imagination," the designer added. The Minimal Nativity set comes tessellated in a square black box and Voirin is selling them via her website. She graduated from the Royal College of Art earlier this year and her work focusses on re-choreographing traditional Catholic iconography. You might also want to check out Sebastian Bergne's nativity set where characters are represented by wooden blocks and identified by colour.